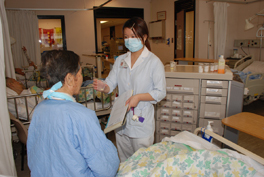 phlebotomists are deployed to wards to perform non-clinical auxillary duties. PYNEH is established, in additiona to a Main Pharmacy, a satellite pharmacy dedicated to serve the medical wards to improve patient care. Nursing Service in Pamela Youde Nethersole Eastern Hospital (PYNEH) carries forth the spirit of Florence Nightingale and brings the profession to a new horizon. To allow nurses to focus on professional development, some of the low end services like blood-taking and daily caring have been delegated to healthcare assistants. We have the first Nurse Consultant on wound care service appointed by the Hospital Authority and developed 3-tier wound management to enhance professional development, patient care and surveillance. Nurses also have their own sub-specialty nurse led clinics like urology, diabetics, renal, etc., offering their expert opinions to patients and public. The old Nethersole Hospital was the first hospital in Hong Kong providing nurses training. PYNEH inherited this centenary learning culture and has extended it our counterparts in Mainland China. Long-term collaboration and experience-sharing with nursing professionals from China started in the early 1990s and the passion for foster learning culture continues.